Nvidia has lifted the lid on its new quad-core processor for tablets and smartphones – Tegra 3. Nvidia is launching the chip at the same time as Asus is announcing the Tegra 3-toting Asus Eee Pad Transformer Prime, but it's by no means alone in the quad-core stakes. We've known that quad-core ARM-based processors have been on the horizon for some time and we'll hear a lot more about them from other ARM partners such as Qualcomm, with its Snapdragon S4. But wait, aren't there five cores in the picture below? Yes. But you'll have to read on to find out more about that. Tegra 3 is based on the ARM Cortex-A9 MPCore microarchitecture and the four cores can run at speeds up to 1.3GHz. The chip is manufacturerd by TSMC (Taiwan Semiconductor Manufacturing Company) using a 40nm process. Tegra 3 has five times the raw performance of Tegra 2, a remarkable improvement that's set to carry on through the different generations of Tegra – check out Nvidia's roadmap below. That means there's some serious performance to come from Tegra over the next few years. Yep, you heard us right. Tegra 3's little-known fifth core was first detailed in September. The core has what Nvidia calls a Variable SMP architecture – the SMP stands for Symmetrical Multiprocessing. You were wondering, weren't you. This "companion core" runs at a lower frequency and operates at low power. Nvidia says the Variable SMP architecture is completely OS transparent, which means that operating systems and applications don't need to be redesigned to take advantage of the fifth core. So whether the chip is powering Android 4.0 or Windows 8, each OS will not need any code written into it. "During less power-hungry tasks like web reading, music playback and video playback, Kal-El completely powers down its four performance-tuned cores and instead uses its fifth companion core," explained Wuebbling in a September blog post. "For higher performance tasks, Kal-El disables its companion core and turns on its four performance cores, one at a time, as the work load increases." It's worth noting that the chip won't use five cores at once; it can only use either the four main cores or the single vSMP core. 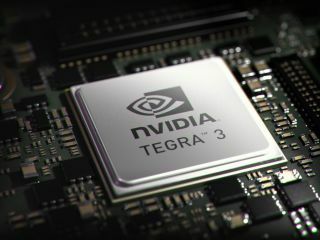 Nnvdia says quad-core Tegra 3 uses less power than dual-core processors "across all performance points". We were surprised that the recent Motorola Xoom 2 plumped for a dual-core Texas Instruments OMAP processor, but we're not having to wait too long for a Tegra 3 quad-core tablet - the much rumoured Asus Eee Pad Transformer Prime has been officially announced this morning. Tegra 3 includes a brand-new 12-core GPU that delivers up to three times the graphics performance of Tegra 2 and supports up to a 2,560 × 1,600 resolution. There's also support for 3D stereo. Compared to Tegra 3, there's a lot more scope for realistic effects in games giving a more PC-like gaming experience. Nvidia says there are over 15 Tegra 3 capable games in development, while there will be over 40 games available on Android via the Tegra Zone app at the end of 2011. Here are some demo grabs that Nvidia used to show the graphical capabilities of Tegra 3. Likewise these app benchmarks are also against dual-core processors. You can connect many types of controller to your tablet and you can hook it up to your 1080p HD TV for a mirrored display. You can even navigate through Android menus with the controller. Providing you have a 3D TV compatible with HDMI 1.4 or above you can watch and play in 3D using Nvidia's 3D Vision tech.